Angry Birds is one of the famous SmartPhone game (mostly famous among Android users ) developed by Rovio Mobile and have millions of fans. Traditional Angry Birds game needs you to download the software to your Smartphone and install it before playing. Now they introduced a web-based Angry Birds game where you do not need to download any software but just go directly to the web page and start playing. Another advantage of this web version is, you can run it on most of the browsers. 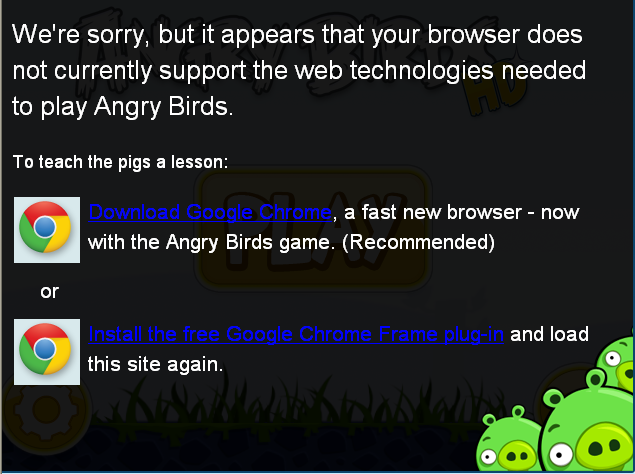 Actually, this web version of Angry Birds is a Chrome App but it works on Firefox, Opera and even in Latest versions of Internet Explorer. However, it will not run on Internet Explorer 6 and below versions. It is same as traditional Angry Birds and some game controls are listed below. If you want to select a bird, you should click on it (left click) and drag it. To use the special powers of the birds, you should use left click. Key R is used to reset the game level. You can scroll down and up to Zoom out and Zoom in. This zoom feature helps you to aim properly with the green pig. 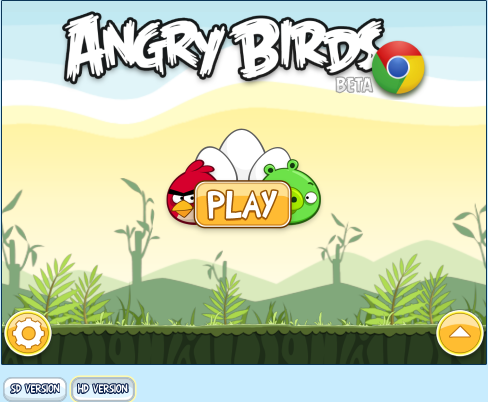 To play Angry Bird web-based game click on the link below. You should click allow if you want to use the Angr Birds details when you are offline. Though I successfully played Angry Birds game in Firefox, Google Chrome, and Opera, I failed to open the page in Internet Explorer 6. I received following error message while trying to load Angry Birds. Though Angry Birds is a stable popular game, it is not free from bugs and errors. Occasionally people find the bugs and report them. If you found a specific bug or issues with playing this game on your Smart Phone, you can list it on their website. It is important to note that if the same bug is reported already, you do not need to register it again. Alternatively, you can check their bug page for any possible bugs on the game version you are currently using. So I suggest you visit the page below in case if you found issues with playing Angry Birds game on your mobile handset. Once you report the bug, they will fix it on their next version. So you are recommended to update the current version installed. Another useful resource is their support forum. You can directly comment on the trouble you are facing while playing it there. The support forum members will either advise you to how to fix the issue or inform it as a bug and will fix on next version. Link to their support forum is given below. So if you do not want to play hard to go to the next level, there are some cheat codes available. It is for both Android and iPhone. There are some resources which reveal how to unlock Golden Egg levels. One top secret to getting the extra benefit is to don't skip challenges. To unlock the next level or unlock the entire game by using the cheat codes mentioned in the articles below.